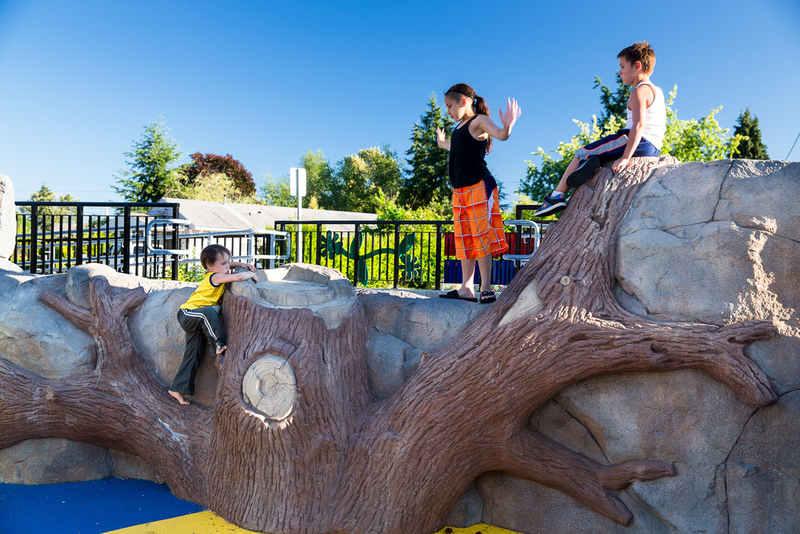 In Renton, Washington this playground combines accessibility with inclusion for all ages. 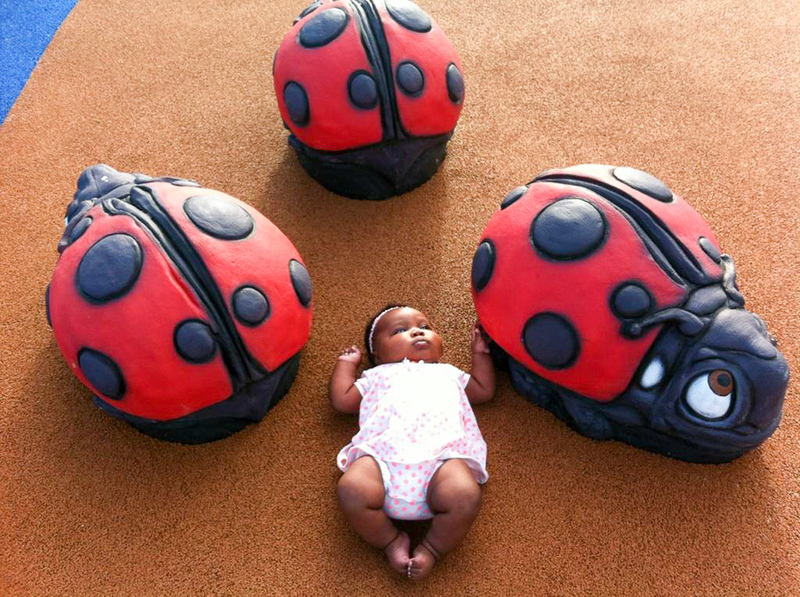 A caterpillar play sculpture, lady bugs, climbing boulders, and kinetic play pieces provide a high level of interactivity. 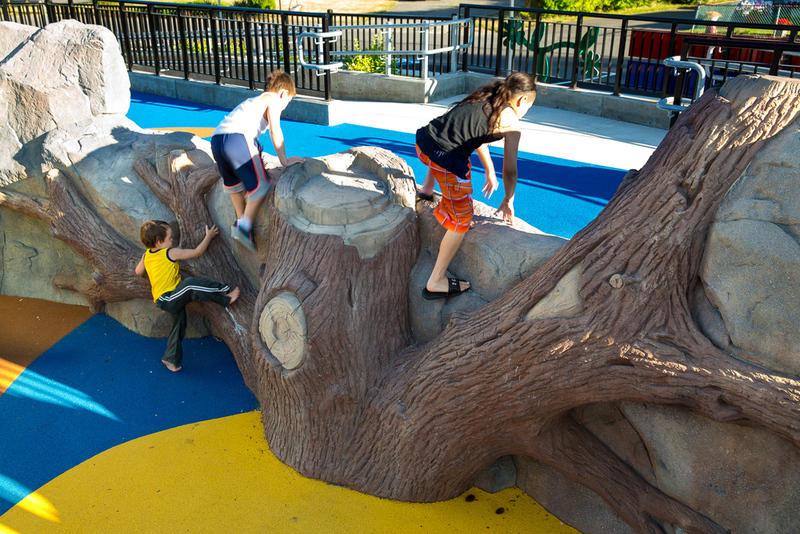 Meadow Crest Playground is an idyllic inclusive playground that is the first of its kind in Renton, Washington. This 1-acre playground represents the first time the City of Renton and Renton School District collaborated on a joint-use project. It represents one of the first joint-use city and school district agreements in the state. And, most important, it was the first time that Renton children with a whole range of abilities could play side by side at an entirely accessible playground. Meadow Crest Playground replaced two small playgrounds for the city and school district that sat back-to-back, separated by an eight-foot chain-link fence along the property border. The playground on the city side was part of a site that includes the North Highlands Community Center, while the school district side had an aging playground that served the Hillcrest Early Childhood Center, which was being replaced with the new Meadow Crest Early Learning Center. The district wide public preschool enrolls 600 children, ages three to five, about half of whom have special needs. The layout and play equipment are focused on creating barrier-free access for all children, regardless of their physical, intellectual, and/or emotional challenges. It is also designed to allow children to play together with their teachers, aides, friends, and family members. All play areas have adjacent paths for continuous easy movement. The colorful park has a nature motif, with plants and creatures depicted in the equipment and the poured-in-place rubber surfacing. 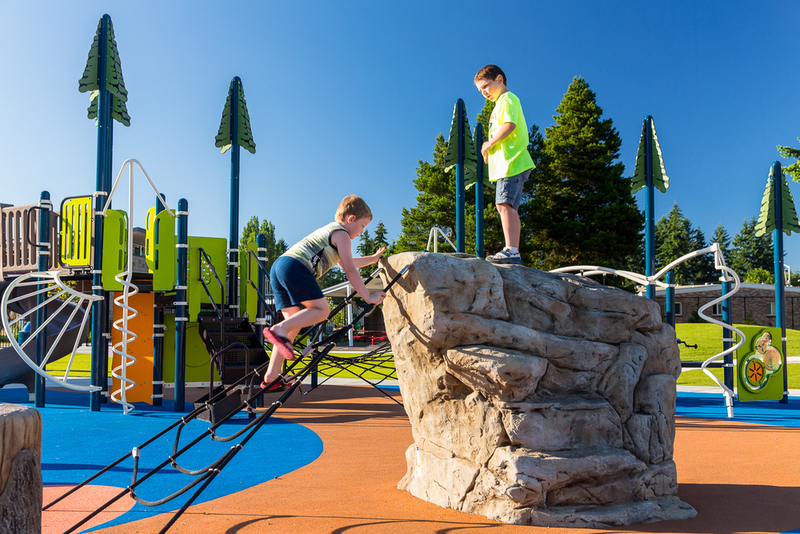 The playground includes features designed to encourage healthy physical development, such as slides, swings, spinners, and climbing rocks, as well as nontraditional playground activities designed for sensory development. Perhaps the most popular spot—the “icon of the whole playground”--is the 25-foot-long multi-colored caterpillar sculpture, says Todd Black, ASLA, capital project coordinator for Renton’s Parks Planning & Natural Resources Department. “It’s not only a cool design, but also very functional. Kids can climb, exercise their fine and gross motor skills, and really feel their accomplishment as they climb to the nose of the caterpillar.” Black adds that he’s seen 200-pound adults clamber over the caterpillar, balancing on the disc swing, and try to fit into the bucket swings. The playground is divided into three areas: One play area focuses on early childhood, one focuses on children ages 5 to 12, and one is easily used by both groups for climbing, swinging, spinning and sliding. Children can play anywhere on the playground, but the design allows younger children to play independently from older children, whose play area is delineated by a low seating wall. The early childhood areas feature equipment that helps young children develop balance, coordination, social skills, and imagination. They can climb on a sculpted ladybug, and spin in an Omni Spinner and on a ring-like Super Nova. A glider swing is big enough to accommodate a pile of kids, including those in a wheelchair. Children can try the balance beam and play in a little house. In the painted-games area, they can hopscotch on a dragonfly or balance on a bee flying to a flower. 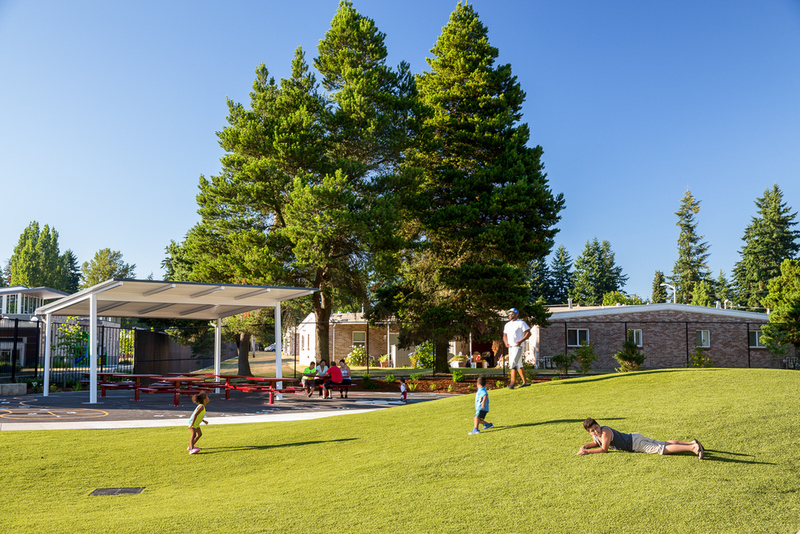 The Rolling Hills synthetic turf mound invites them to climb up and roll down, and in a climbing area, they can travel the circular walk or climb the tree to the top of a play structure and slide down the slide. Children on tricycles or in wheelchairs rolling on the Wavy Walk can stop at a stop sign, fill up at the gas station, and slow down in the school zone. They can also enjoy the sensory delight of making music on oversized instruments. 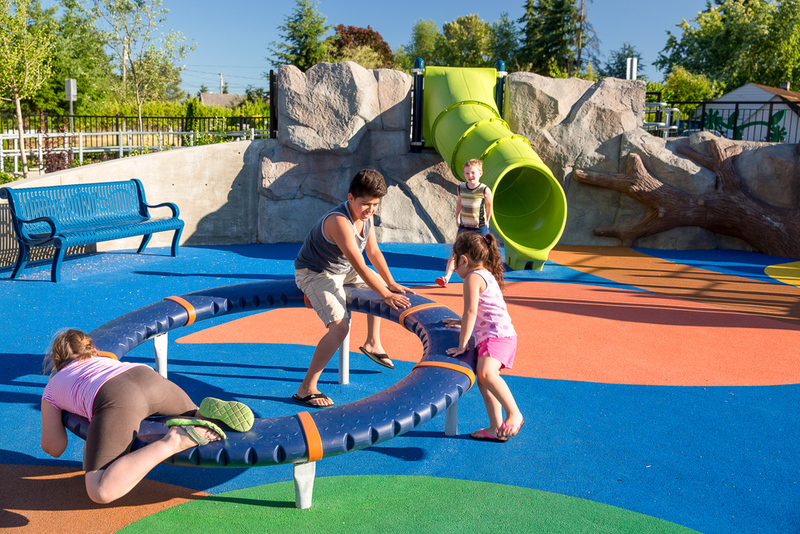 Renton School District, the City of Renton, Renton Rotary and individual partners have built a new inclusive playground for children and youth of all ages and physical abilities. Open now at 1800 Index Ave NE in the Renton Highlands!